There has been a deep love in my heart for sweet chili sauce for a very long time, and I’ve tried to make it several times, and it’s been hit and miss. This recipe nails it: it has the heat but is packed with flavour as well. It will be my standby sweet chili recipe from now on. I prefer to use Habaneros because it gives a nice orange citrus flavour to the sauce. 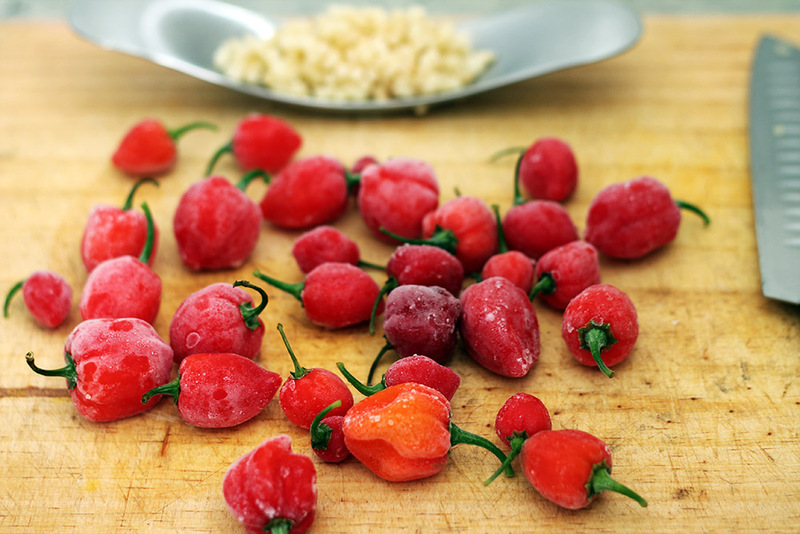 Storing chilies in the freezer really helps when you’re going to make a bulk batch. Add to a pot, the sugars, vinegar, and water, and let dissolve. Chop up the Garlic and Habaneros, and add it to the pot (do yourself a favour and wear gloves for this whole recipe, even the steam from the pot will leave chili oil on you). Bring it to a slow boil (no. 4 out of 6 on my stove), and let it boil with a lid on for about 15 minutes. Give it a taste – if you’re happy with it then take off the lid and let it reduce till it’s slightly syrupy. It will thicken a bit once it cools. The pot vapours can be quite strong so make sure there’s a draft, and no pets nearby.